Thermal conductivity of individual rock types plays a noteworthy role in melting of the ice mass at the contact with the rocks. These are heavily influenced by their mineral constituents and the structural fabrics within the rocks. In the decreasing order of influence on melting of the nearby ice mass, the exposed rock units of Schirmacher Oasis are demarcated as metapelites (6.1 ± 0.37 Wm−1K−1), quartzofeldspathic augen gneiss (6.08 ± 0.04 Wm−1K−1), garnet rich biotite quartzofeldspathic gneiss with rare layers of amphibolites (4.34 ± 0.68 Wm−1K−1), charnockite-enderbite interlayered with pyroxene granulite (3.99 ± 0.44 Wm− 1K−1), quartzofeldspathic gneiss ± garnet with few enclaves of charnockite and pyroxene granulites (3.53 ± 0.22 Wm−1K−1), norite (3.38 ± 0.26 Wm−1K−1), dolerite dykes (3.32 ± 0.15 Wm−1K−1). Metamafic and metaultramafic rocks occurring as enclaves in charnockitic zones (3.07 ± 0.11 Wm−1K−1), nodular basaltic dykes (2.98 ± 0.16 Wm−1K−1) and lamprophyre dykes (2.77 ± 0.18 Wm− 1K−1). The detail investigation around Dakshin Gangotri Glacier snout at the margin of the Schirmacher Oasis and the Polar ice sheet indicates that the rocks with higher thermal conductivity values show a higher average annual recession than that of the lower thermal conductivity values. The spatial distribution and the variations in the thermal conductivity of the rocks in different places within the Schirmacher Oasis are one of the factors contributing to the differential rate of Polar ice sheet recession at its margin. Swain, A.K. (2018) Bathymetry of Schirmacher Lakes as a tool for Geomorphological studies. In: Siegert, M.J., Jameison, S.S.R. & White, D.A. (eds.) Exploration of Subsurface Antarctica: Uncovering Past Changes and Modern Processes. Geol. Soc. London, Spec. Publ., no.461, pp. 77–93. doi https://doi.org/10.1144/SP461.13. Swain, A.K., Mukhtar, M.A., Majeed, Z. and Shukla, S.P. 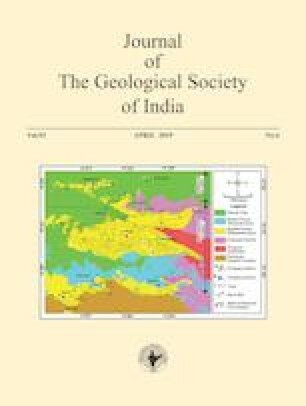 (2018) Depth profiling and recessional history of the Hamtah and Parang glaciers in Lahaul and Spiti, Himachal Pradesh, Indian Himalaya. In: Pant, N.C., Ravindra, R., Srivastava, D. and Thompson, L.G. (Eds. ), The Himalayan Cryosphere: Past and Present. Geol. Soc. London, Spec. Publ., no.462, doi: https://doi.org/10.1144/SP462.11.